After a twitter chat a couple of weeks ago, I began thinking about my writing style and voice. Is it clearly defined? Is it identifiable? I figured the best way to test this would be to set up a little writing style challenge. I've written a paragraph about the above outfit, and also asked Leona and Rich to write one. Can you identify which one is mine? Let me know in the comments and I'll announce which one is mine soon. Yep, today I'm in Primark again! Rocking the hillbilly vibe in this bodysuit and dungaree-dress combo, I love the light floaty skirt. Another nice summery outfit! How perfect is this dress? It makes me feel so cute. I think it's so flattering and it fits perfectly. I love it! The buttons are a really cute addition and the pocket adds a nice quirky touch. You can dress it up and make fancy or add a pair of black leggings and a black top (like I have!) and it wear as a super comfy casual outfit; the perfect dress if you ask me! Today I'm a farmer girl! I actually slip into a West Country accent when I'm overexcited so it kind of fits. I love the look of dungarees and I've wanted a pair for the longest time, but I just can't do shorts. They look terrible on me, and they always ride up. Nobody wants to see that! 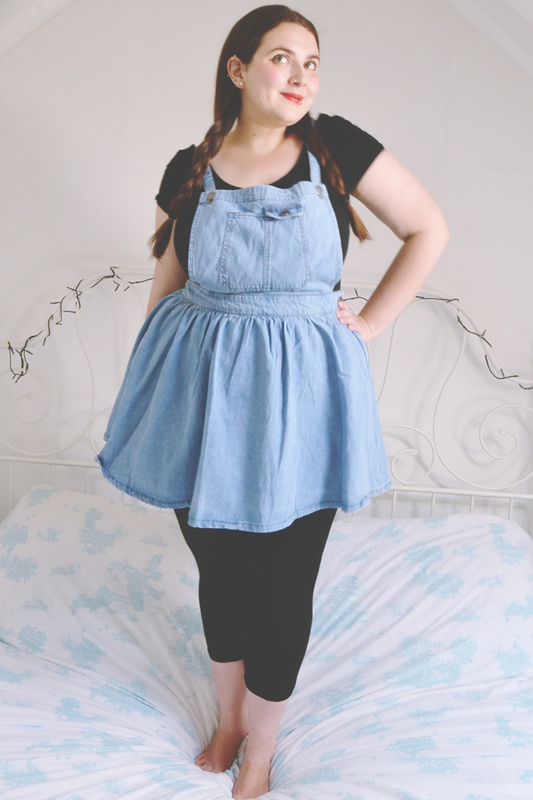 Of course you all know that skater skirts are pretty much my life, so when I saw this dungaree skater dress in Primark, it was like the angels had started singing above me! I am absolutely in love with it. It does make me feel a little like I'm wearing fancy dress, but then I think all the best outfits do! I was the third one! Rich pointed out that Leona made a typo in her paragraph (the second one) which gives it away haha! Try the dungaree thing! Just try something on in the changing rooms and see what you think. You were right about Rich being 1 but I was number 3! Oh this is hard! But I'm going to guess at number 2 (I think Leona is number 3 and Rich is number 1). Yay, you were absolutely right on all three of them! Cool challenge! I wonder what the results will be like. I'm thinking it's either 1 or 2, probably 1. Interested to see if I'm right. 1 was Rich, 2 was Leona and 3 was me! That was Leona! I was 3! You got me and Leona the wrong way round- I was 3! Completely wrong haha! Rich was 1, Leona was 2 and I was 3! You know me so well! You're absolutely right! Paragraph 2 was Leona. Mine was paragraph 3. I'm going to say number 2. Number 1 is too short so I'm going to say that's Rich's and then that would mean number 3 is Leona's? Number 1 is Rich, but Leona is 2 and I'm 3. Hmm, I would say 2 is you. Struggling between separating you and Leona though! Well, that's if Rich is number 1... hahah! I think lots of people got stuck between me and Leona. Rich was 1 but I was 3.